CA Foundation registration last date : Through this article you will get to know the information about the CS foundation registration last date. To become company secretary you should pass three stages of CS exam I;e Foundation, Executive, and Professional. The Institute of Company Secretaries of India conducts CS Foundation exam twice in a year in the months of June and December. Today we are providing details about CS Foundation Registration Last Date For June 2018 Exam, Last date for CS Foundation registration June 2018, How to apply online for CS Foundation registration and what are the documents required and Procedure to apply online for June 2018 attempt. Once the ICSI release the CS Foundation registration last date, we will update here. Keep visiting this article. Applying for Paper-wise Exemption on the basis of qualification for June 2019 Examination. CS Foundation Registration is open throughout the year. Candidates registered up to and including the month of March are eligible to take Foundation examination earliest in June in the same year and those registered up to and including September can take up the examination in June next year subject to satisfactory completion of coaching. CS Foundation Registration Last Date for June 2018 : Candidates registered up to and including the month of March are eligible to take Foundation examination earliest in December in the same year and those registered up to and including September can take up the examination in June next year subject to satisfactory completion of coaching. From June, 2018 Session, the examination enrolment has been facilitated through the new software module. All students in the old system have to reset their password as a first step in the direction of moving to the new system. The Institute has uploaded various user manuals on the website and advised to the students to go through the user manuals. Here we gave some procedure to apply for CS Foundation Online Exam Form for 2018 June exam. User will double click on web browser (recommended web browser Internet explorer 9 or above, Google Chrome 39 or above, Mozilla 38 or above) to open the web browser and type the URL http://smash.icsi.in in the web browser address bar. After successful login user will navigate to Welcome screen where user go to the header menu MODULE and go to sub menu ENROLLMENT. 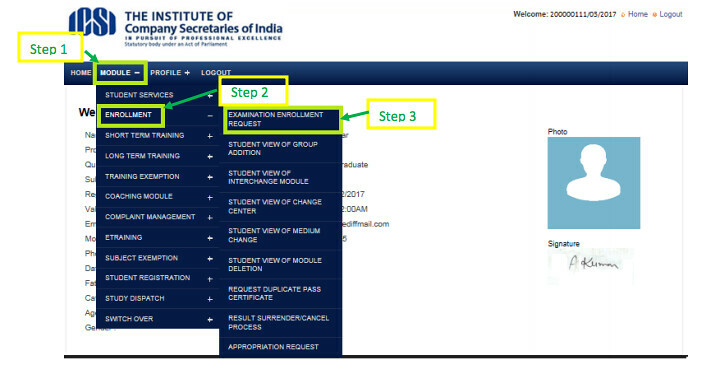 User will click on Examination Enrollment Request under ENROLLMENT sub menu and navigated to the Examination Enrollment Request screen as shown in below screen. User will be navigated to below screen where User Request to Enroll. Click on the “Add Enrollment Request” button to open the enrollment form. Note: Enable popup window of the web browser. Note: Review all the selected information in the enrollment form before clicking on the “Next” button as any later changes will be allowed up to certain stipulated dates and additional fee (varies from time to time) will be levied for all such changes. After the click on “Next” button from screen Enrollment Form, Fee Detail page will be displayed. Read the agreement and check the agreement checkbox (if agree) and then click on “Next” button on Fee Detail screen. On this screen user will have option to go back and make any changes. Click on “Confirm Application” button to make the payment. Select the payment mode and click on “Next” button. Click on Next button to progress the payment and see the payment detail. Click on “Proceed” button to enter the payment detail, system will generate the payment receipt. Student will retain the copy of the receipt for the examination fee remitted by them during the examination enrollment process. In case the enrollment process was not completed in one sitting then user can find the initiated enrollment form under Examination Enrollment Request screen, Search Result. If user click on “Add Enrollment Request” button after enrollment initiation then the message will be displayed “Your request is in progress, please complete it.” on the top of Enrollment Form. Follow below steps if this message displayed. 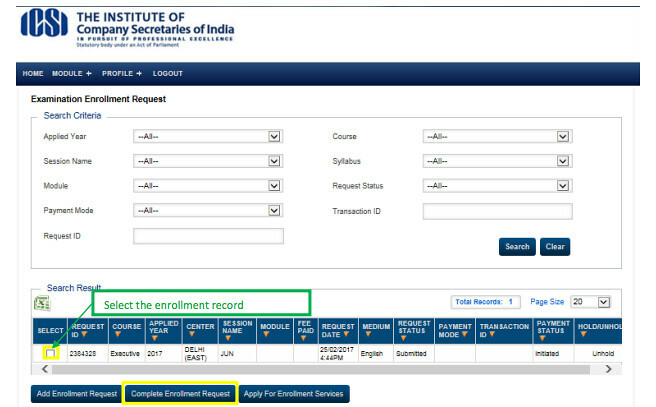 Select the enrolment record and click on “Complete Enrollment Request” button. Make sure popup window is enabled. Continue completing the form from where it was left.